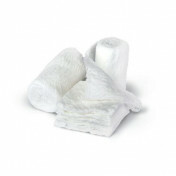 Medline NON25855 Bulkee II Cotton Gauze Bandage 4.5 in. x 4.1 yds, 6 Ply is an ultra thick gauze bandage that can be used for either primary or secondary coverage. 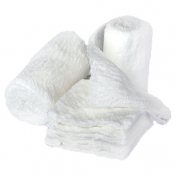 When used as a primary dressing, this 6-ply bandage has an open weave design that provides extra wicking power in order to lift more exudate, allowing for faster healing. When used as a secondary dressing, it's length allows for multiple wrappings around the bandage for better security. Finished edges will reduce linting and increase cushioning for more patient comfort and the material will stretch to provide a better fit. 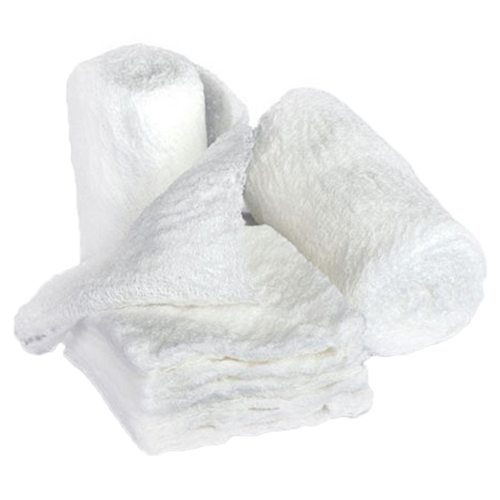 The rolls are 4.5 inches wide and over 12 feet in length for multiple wrappings or to use for one continuous wrapping. To avoid allergic reactions the product is made without latex. I was disappointed with the packaging of the Bulkee II NON25855 Cotton Gauze Bandage 4.5 Inch x 4.1 Yards 6 Ply Case of 100...I expected for them to be package individually...not all 100 in one big plastic bag...have been ordering a lot of items from your site...I thinking I will not anymore..